After a weekend of over-indulgence, I’m always in the mood for something that’s really quick and healthy. I definitely don’t want anything with meat or cheese in it. For once. This Thirty Minute Chickpea Stew recipe was inspired by a recipe that was in the most recent Bon Appetit. I say inspired because I changed almost every main ingredient except chickpeas. The original had chicken in it, but I felt like keeping it veggie packed so I nixed the chicken and added in a few potatoes and some kale. The bonus piece of cutting out the chicken is that it also trims about 20 minutes off of your prep time. 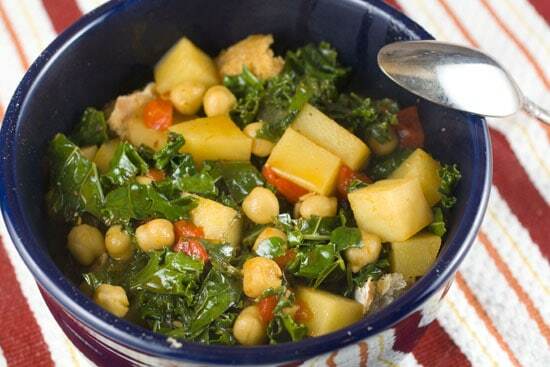 A quick and simple vegetarian stew that’s filling and warming thanks to chickpeas, kale, potatoes and lots of spices. 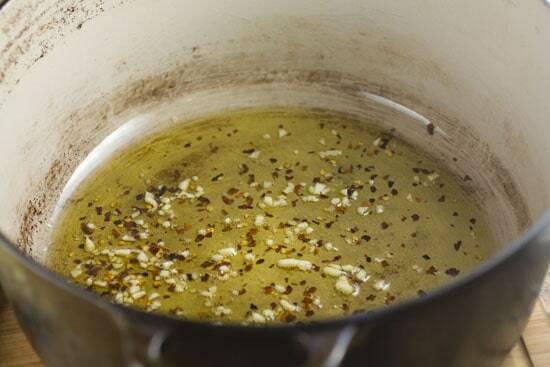 1) Add olive oil to a large heavy pot over medium-low heat. Add minced garlic and red pepper flakes. Cook for a few minutes until fragrant. 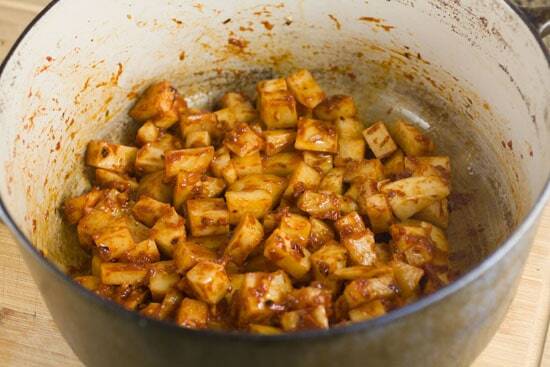 2) Add in cubed potatoes, tomato paste, and cumin. Turn the heat up to medium and cook for 5 minutes, stirring regularly. 3) Add in vegetable stock, chickpeas, bay leaves, roasted red peppers, and a pinch of salt and pepper. 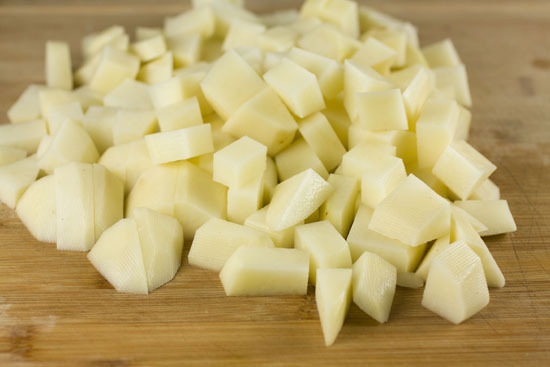 Bring to a simmer and simmer until potatoes are soft, another 10 minutes. 4) Stir in kale and lemon juice. Season with salt and pepper. 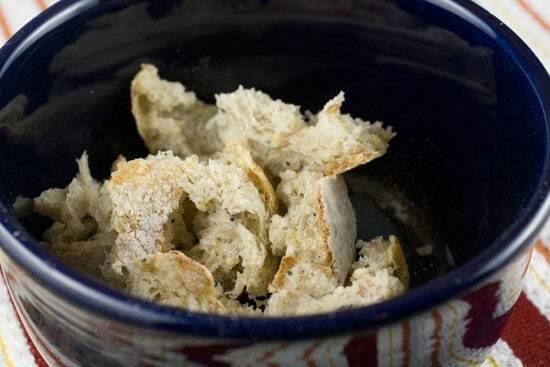 5) Break up some crusty bread in the bottom of a bowl. Ladle stew over bread. Serve immediately. I think one of the best things you can learn as an at-home cook is to master the simple veggie stew. 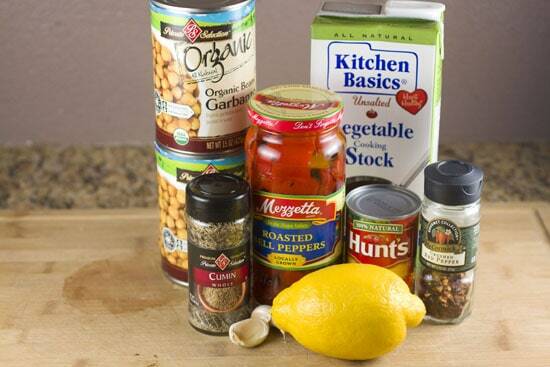 Learn how to balance the spices and flavors in a stew and you can usually make a fantastic meal with a few fresh veggies, a few canned foods, and some simple stock and spices. For this version (and for a lot of stews that I make), these are some of the basics. I was worried that by cutting out the chicken, my stew wouldn’t have enough body to be really filling. I’m not sure if that’s entirely true because there’s still bread in the soup also. But, I decided to add in a few chopped potatoes at the last minute. I liked the potato addition, but I also think it would’ve worked fine without them. Gives the stew some body. 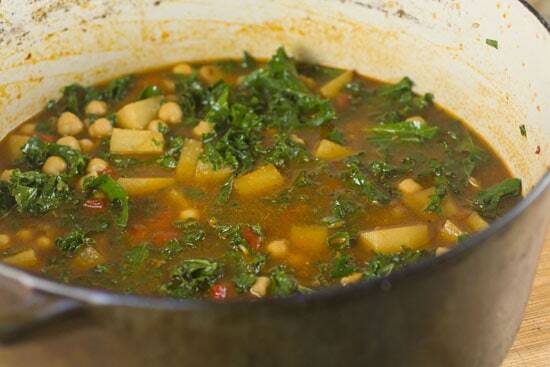 Canned chickpeas make this stew super-quick. It would add on at least an hour to use dried chickpeas and I’m not sure you would get much for your extra work. Just be sure to drain and rinse the chickpeas well. Rinse these guys pretty well. 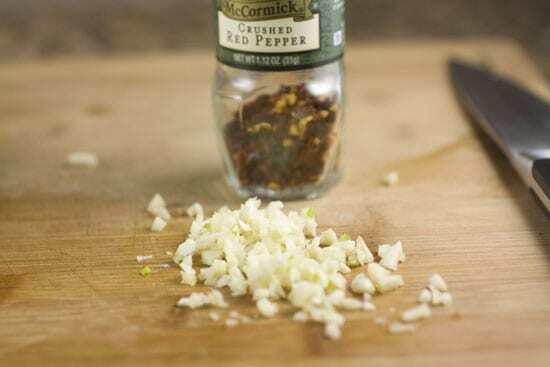 To start the stew, we need to infuse some oil with two really flavorful things: garlic and red pepper flakes. The key to doing this correctly is cooking the garlic and pepper flakes over fairly low heat for a few minutes. If you crank the heat to high, you’ll completely char the garlic. Instead, just add them to the olive oil over medium-low heat for a few minutes. When it starts to get really fragrant, you know it’s ready to go. The garlic shouldn’t even be browned really. Next, add in the potatoes, tomato paste, and cumin. This will immediately start to smell amazing. Stir it all together and let it cook for a few minutes. You can turn your heat up a bit to medium at this point. After a few minutes of that, just pour in the vegetable stock, add the bay leaves and chickpeas, and bring the whole thing to a simmer. At this point, the stew is pretty much done when the potatoes are cooked through which will probably take another 10 minutes or so. There’s a few ingredients to add to the end of the stew that completely make it in my opinion. First, roasted red peppers. Honestly, I’m not sure that I’ve ever had roasted red peppers in a stew before but they worked great and paired really well with the chickpeas. Next, I added some chopped kale. You could also use something like swiss chard if you wanted. A leafy, sturdy green really helps the stew out though. One of the most important ingredients is lemon juice. The acid just makes all the flavors really pop. Don’t forget it! Gotta toss in some greens. Once all that stuff is stirred in, just season it with salt and pepper and you’re ready to go. This stew took me about 30 minutes to make and I was taking photos and stuff. You could probably make it even faster! The stew tastes good as-is, but to really turn it into a meal, just put about 1/2 cup of torn bread into the bottom of your bowl before you serve it. Any super-crusty and slightly stale bread will work great. Then just ladle on the stew with some of the broth and you’re all set. Hard to beat in my opinion. Betsy and I devoured this and we had plenty for leftovers also. 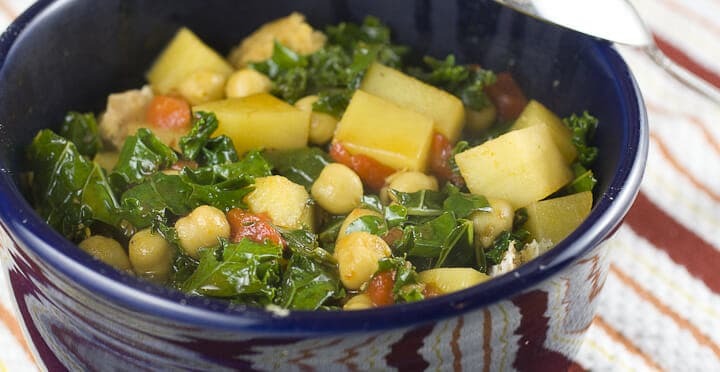 Give this Thirty Minute Chickpea Stew a shot this week if you are crunched for time and looking for something healthy and filling! Love the recipe, we also love chickpeas. They are just so good for you. But, I question your comment about adding an hour if you use dried chickpeas. Well, since that is all I use, it takes at least 8hours of soaking them, then boiling for an hour if your lucky and they are freshly dried vs ones that have been on the shelf for a longer period. That is unless you have a quick trick to cooking dried chickpeas in an hour. There is a secret that we use. 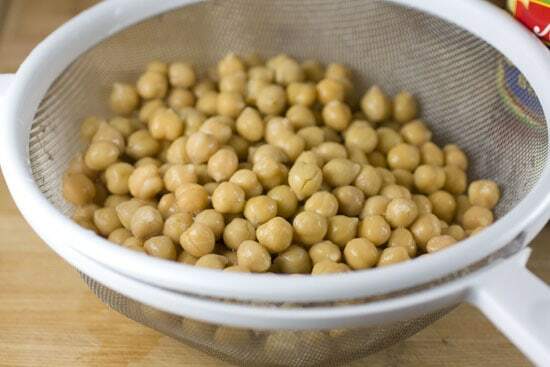 If you’ve forgotten to soak the chickpeas, wash them in hot water. then soak for an hour in boiling water. Then pressure cook with 1/2 tsp of soda bicarb or cooking soda. Give it 3-4 whistles (do you guys use a pressure cooker?). Let the cooker cool down until all the steam is released before opening. proceed with your recipe. We use chickpeas in salads, in couscous, in a dish called shundal etc. it contributes protein to an all vegetarian diet. Nice looking Stoop! I love the way you turned a chicken stew into a veggie stew. A person could find themselves going back for seconds, or thirds with that. I like to put a little masala spice into mine, and since I am not totally veggie, make it with a little chicken stock. All in all, a great dish for the winter when you need some comfort. This is very close to an Indian dish called channa that is served with Indian bread called rotis or puris. 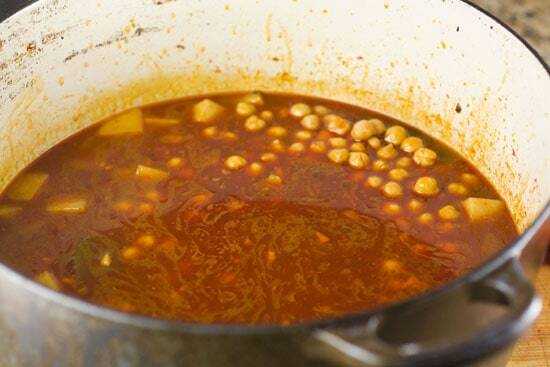 The chick peas are soaked overnight and then pressure cooked with a pinch of cooking soda. The gravy is made by blending onions, ginger, garlic tomatoes and green chillis. You cook this paste in oil, then throw in your cooked chickpeas (and potatoes if you wish) and simmer them all until the flavours infuse. Yummy stuff. The masala powders you use (optional) are cumin and coriander powders and amchur or dried mango powder. That gives the dish a tang. Lemon loses its kick when the dish is reheated. so we use either amchur or tamarind for the vital vitamic C.
Do try this sometime and serve with bread or rotis or tortillas. The spices are optional not essential. They just make a more flavourful dish. And wedges of lemon (and green chillies) are always put on the side for those who want it tangier and spicier! Mango powder is put in a lot of veggies to make them tastier. that looks really good. i like the fact that it has no meat in it, can’t go wrong with a good vegetarian meal! will try this one for sure. I love this! We had it tonight, and it feels so healthy and hearty at the same time. Thanks for sharing. Made this yesterday for Ash Wednesday and it was sooooo good! I also added onion, masala, and mango powder as others had suggested. It was deliciously spicy too! My roommates really liked it and didn’t miss eating meat. I’ll definitely make this again! Just tried this today because of lent….even the three year old liked it definitely will make again! Made this twice now cause its so awesome and delicious, the red pepper flakes provide a good amount of heat and the peppers are a surprisingly good edition, even my meat loving boyfriend enjoyed it and didnt miss the meat too much lol. Used spinach the first time since I had some in the fridge, and unfortunately my peppers went bad tonight so I added carrots and celery I had on hand. This is now one of my favorite recipes! Just made this tonight! Turned out great!